Health care spending accounts for 17.9% of U.S. gross domestic product (“GDP”), according to federally-reported data, and is expected to grow another 2% by 2026. With this dramatic increase in healthcare, pressure continues for cost reductions leveraging IT and technology to increase the efficiency of delivery organizations, including provisions for regulatory compliance, and secure data. Clearly the goal for all such solutions remain the improvement of positive patient outcomes. True Nature Holding Inc. (OTCQB: TNTY), an Atlanta, Georgia-based health information focused company, sees one answer to this need: the convergence of health care and information technology (“IT”). True Nature continues to evolve its strategy based on identifying new market needs much like the continuous evolution of IT overall services and the technology market; Management understands that as the IT and health care markets move forward, the Company needs to be nimble enough to address emerging market needs. All solutions must provide for the highest level of compliance with regulatory requirements, and in a secure manner. 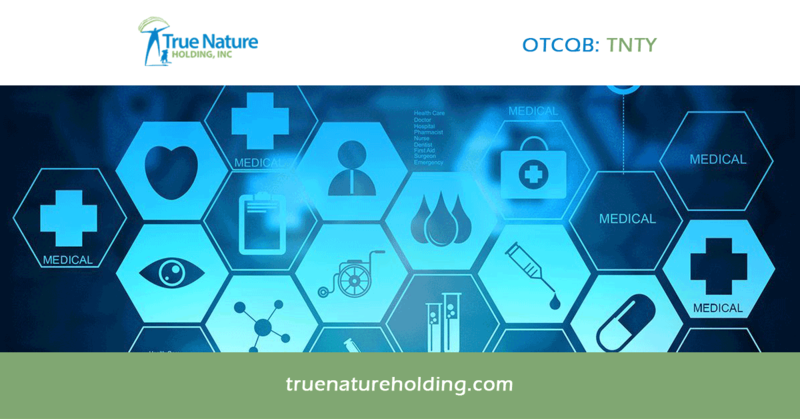 True Nature Holding, Inc. continues to carefully evaluate trends in the health care, compliance and secure data marketplaces seeking to enhance shareholder value by looking toward the future. True Nature believes that standardized technology solutions could be enhanced and deliver more value to their customers in specialized practice areas by customizing the user experience to better reflect their normal practice workflows. This allows both local and corporate level providers, practitioners and professionals to deliver greater value at a lower cost to improve outcomes. Leveraging these approaches to business growth, True Nature Holding continues to pursue strategic acquisitions of early to mid-stage companies with synergistic tech solutions to improve healthcare outcomes for both human and pets. Clearly, advancement of health care technology is being driven by major players like Apple, Google, Microsoft, and Amazon. These juggernauts look for supporting firms to help deliver high-quality tech to its customers. True Nature already has partnerships with these companies and plans to leverage those partnerships as new tech is introduced to the health care sector. Whether it’s blockchain prescriptions or data analytics, True Nature is tracking opportunities that improve the patient experience. True Nature President and Interim CFO Jim Crone is also focused on increasing shareholder value. The Company’s leadership team is supported by expert advisors. They accrue a modest salary but are not yet drawing funds from the Company. True Nature is committed to operating with the utmost efficiency to ensure its goals are aligned with those of company shareholders. President Jim Crone brings more than 25 years of experience in sales and advertising, while Chairman Ron Riewold brings over 35 years of experience to the table. Riewold’s background of managing and operating both public and private companies in the health care and technology sectors is invaluable to the Company’s future. The team is also supported by marketing, e-commerce, financial and pharmaceutical advisors. These advisors ensure the company makes decisions that will best benefit their shareholders. Digital Health has been steadily growing in the past several years, with the industry seeing its peak in 2018 at $8.6 billion. However, industry analysts say they believe the best is still yet to come. With over half of the deals closed in either Seed or Series A rounds, investors still have time to join the movement. When adding on compliance and security solutions, the market potential is further expanded. The next few years will see the solutions brought to market, which will only increase public dependence on IT services for both themselves and their pets. One specialist tool that True Nature is focused on is a way to give patients on-demand access to their records. This will not only eliminate the need for a call or fax between office visits but can also give consumers more insight into their overall health. It’s clear that our tech-based culture will use IT services that expedite their doctor and vet health care. Mr. Crone has stated that his goal is for the company to expand into international services by 2020. As for the remaining months of 2019, the goal is to accrue a portfolio of businesses with $20 million in annual sales at a 20% pre-tax margin.